During the fifth inning of tonight’s whooping of the Nationals, Jayson Werth got underneath a 2-0 pitch from Garrett Mock and sent it straight up in the air headed towards the 300 level just above the CSN broadcast booth. A gentleman who was sitting up in those seats quickly realized he had a shot at the ball, so he stood up, leaned over the railing, and to the delight of the crowd, made an impressive catch. 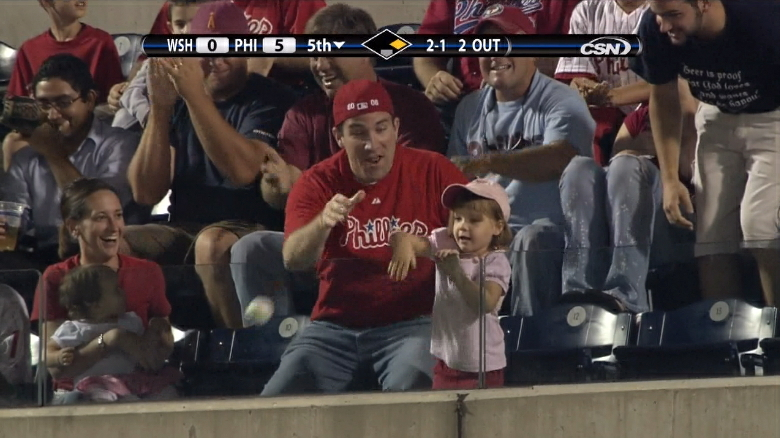 And being the good father that he is, he then handed the ball over to his daughter, who immediately turned around and tossed the ball back over the rail and into the Diamond Club behind home plate. …Thus creating what is easily the funniest fan-unintentionally-throws-baseball-back-onto-field instance in sports history.